A group of young inmates are given the opportunity to turn their lives around by becoming volunteer firefighters . When Aurora finds Poppy murdered in her home, the "Real Crime" club members gather to discuss the case and end with four suspects and four motives. A cute college professor teaching "Who Dunnit" fiction gets involved in the police investigation of the theft of a mega dollar research plant, the death of a student, disappearance of another and an alleged suicide. While setting up a charity garage sale, Jennifer Shannon discovers a body in the attic of a nearby home. Using her eye for detail, as well as her experience with antiques and murder, Jennifer puts together clues that help catch a killer. When consumer news reporter, Ruby Herring stumbles onto a murder, the intrepid redhead inadvertently discovers a knack for crime solving. With the reluctant help of a handsome detective, Ruby finds a new career covering crime. Amateur detective Jen finds a young woman's body in a storage locker after auction buying the contents of another for her store. Jen just can't stay out of the investigation while the rest of the family is busy building homeless housing. Jennifer discovers an antique camera at the estate of a photography enthusiast. A librarian who hosts a murder mystery book club at work finds people connected to the group are being killed off one by one like crimes in some of the books they read, based on real murders. The Hallmark Channel has a winner in this very slow-starting but finally compelling movie of how young girls redeem themselves at a Youth Correctional Facility. 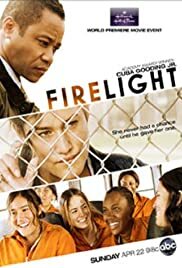 The movie starts out looking a lot like a standard girls in prison movie -- without the usual cheap-movie lesbian subtext -- as Q'orianka Kilcher winds up in prison and is tempted by the safety and rewards of a gang and the self-respect of joining a firefighting group. In many ways this movie is a throwback to the prison reform movies of the 1930s. Although Cuba Gooding Jr. is the big name for this movie and Ms. Kilcher the lead, the script shows us other girls, to illustrate the various choices and phases of the process. DeWanda Wise has the most interestingly written role and performs well. Although there is little out of the ordinary in this movie, its earnest good will and insistence on the basics of real story-telling -- the change of human character -- make it a superior work that made my eyes tear up towards the end.